Top quality windproof fleece with a breathable membrane between the inner and outer layer. This fabric blocks 100% of the wind and offers maximum protection from the elements. Good 2-way stretch. 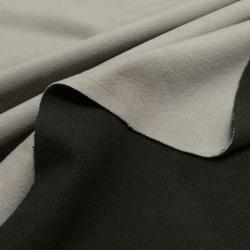 One side has a black and the other a grey non-pilling top quality fleece. At best in warm hats and neck gaiters. Only 31.24 m left in stock, after the stock is empty this product is not available.